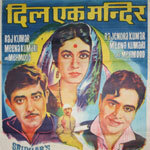 "Dil Ek Mandir" is a 1963 hindi film which has Rajendra Kumar, Meena Kumari and Raaj Kumar in lead roles. We have 5 songs lyrics and 5 video songs of Dil Ek Mandir. Shankar and Jaikishan have composed its music. Lata Mangeshkar, Mohammad Rafi and Suman Kalyanpur have sung these songs while Hasrat Jaipuri and Shailendra Singh have penned its lyrics.